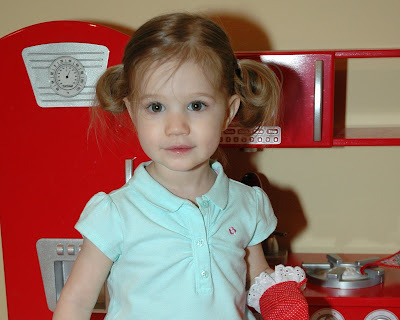 Last Christmas Ava received a kitchen set from Santa. It has since become her favorite toy. We keep the kitchen down in the basement, so Ava is constantly asking to "go downstairs and play with the kitchen". Once in the basement, she'll say "Daddy/Mommy come cook". She really enjoys making pizza and cupcakes, which she then serves up to her mommy, daddy, and little brother Jellybean. She also likes preparing bananas and bottles for her baby dolls. She sometimes gets a little silly when she's in her kitchen. She also tends to make a pretty big mess playing in her kitchen, but she'll typically help clean-up afterward so long as we sing the "Clean-up Song". We can't wait until she's old enough to do some real cooking. She's so stinkin' cute!! That looks like a sweet kitchen set!! She will be a BIG help with lil' Jellybean!! What a great retro kitchen! I still remember playing with my "Party Kitchen" when I was little, and they are some of my favorite memories! How much fun for her! 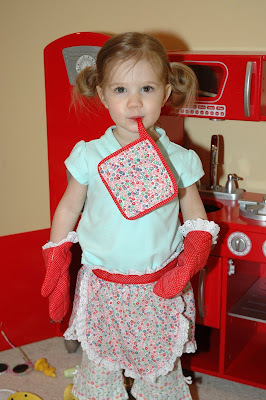 I love the oven mitts and apron. They really make the outfit. 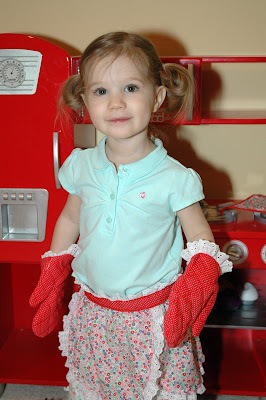 How cute she looks in her little apron and oven mitts! I love the things that little girls like to play-she's so darling!! she can come and cook with me anytime!